Given the world’s ever-increasing obsession with technology – the way gadgets control us more than we control them; as these technologies, supposedly designed to make our lives easier, only lead to further reliance on technologies – Modern Times (1936) is now more timely than ever before. The promised future of a world where machines do everything, allowing humankind to bask in an eternal glow of idleness, shall never arrive, for the machines will always be dependent upon humans to build, oversee and repair them (and many of the products made by the machines need to be replaced – see the comedy masterpiece The Man in the White Suit, 1951). And that’s exactly how the wealthy industrialists of the world want to keep things: the worker shackled to a life of fruitless labour, threatened with the prospect of unemployment at a moment’s notice if he or she refuses to toe the line and accept substandard working conditions, lowly remuneration, and lack of entitlements. Such is the plight faced by the hero of Modern Times, a nameless factory worker (played by Charlie Chaplin, who also wrote and directed the film) who finds himself at odds with the monotony of work and harsh realities of unemployment, as well as numerous other misadventures. In a cinematic climate (and society in general) cluttered with motion pictures that attempt to sell us on the idea that avarice is admirable and everyone can be rich (which is a bit different from saying that anyone can be rich), a world that teaches the workers to demonise the unemployed (instead of encouraging the workers to direct their rage – as they should – towards the capitalists who rely on the perpetuation of poverty to maintain their wealth), and would have us believe that stealing a loaf of bread is akin to attempted murder, Modern Times is refreshing for its enlightened view of society. It is a film that casts a sympathetic eye over the mitigating circumstances that makes so-called criminals out of decent people, as well as being a film that is disdainful towards those capitalists who strip workers of their dignity and reduce them to little more than slave labour. Despite becoming the biggest name in the world of motion pictures (for a time) and the toast of Hollywood, Chaplin never forgot his impoverished roots back home in England. 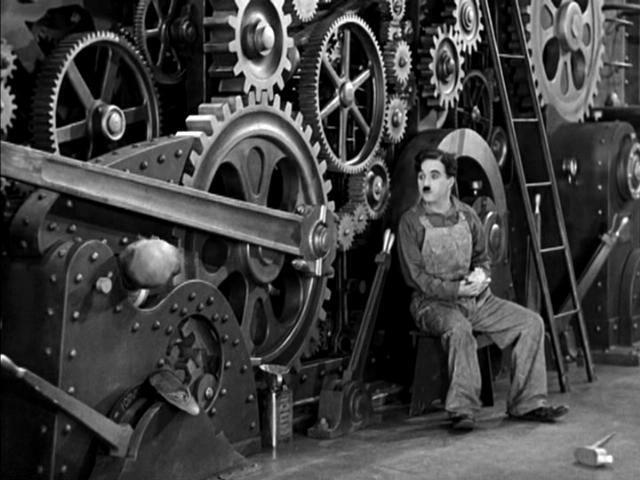 Modern Times is not only a satire of modern factories and machinery, it is also Chaplin’s valentine to the indomitable spirit of the disenfranchised, the downtrodden, those desperate individuals who have nothing but their dreams, a few garments of clothing, and perhaps one last remaining shred of integrity, in the face of adversity. 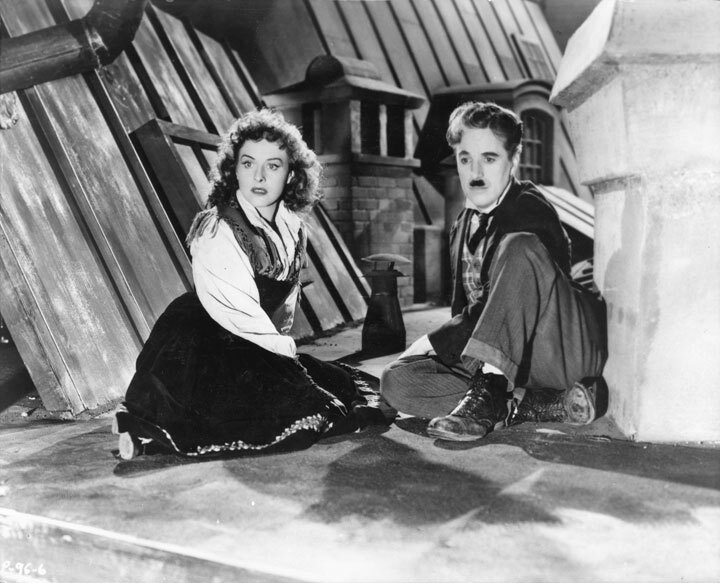 A mostly silent film (similar in this respect to the mostly silent recent revival film The Artist, 2011), and generally considered to be the swansong for Chaplin’s Little Tramp character, Modern Times also proved to be the breakthrough picture for Paulette Goddard (Chaplin’s third wife), playing the role of the Gamine (a more charming street urchin I’ve never seen – she is one of my favourite motion picture characters). 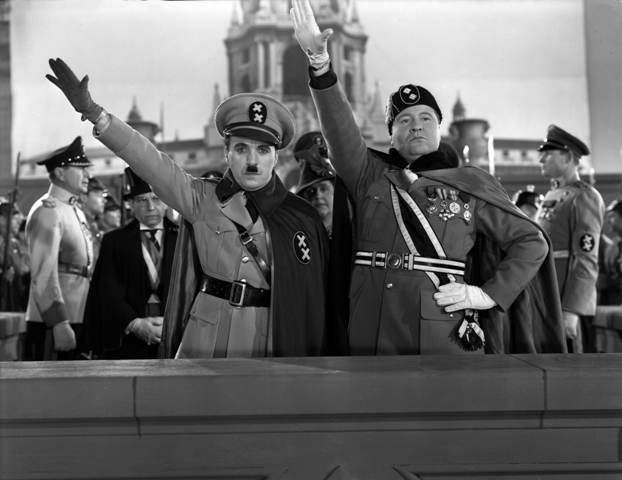 Chaplin and Goddard would later reunite in front of the cameras for the talking picture, The Great Dictator (1940), featuring Chaplin in the dual role of a meek Jewish barber, and Adenoid Hynkel, ruler of Tomainia. I don’t believe I need to tell any of you readers who is being lampooned by the latter character, but you might be interested to know that according to records kept by the Nazis, the real-life Führer twice watched The Great Dictator. Alas, no record was kept of Hitler’s reaction to the film (this being a source of frustration and curiosity for Chaplin for the rest of his days). The running gag throughout the film is the uncanny resemblance between the Jewish Barber and Adenoid Hynkel, inevitably leading to a case of mistaken identity. Consider the more recent tyrants and the cults of personality that surround each one: how much stock do their followers place in the carefully-fabricated image, and how much do their followers know of the person behind the facade? If the so-called important politicians of the world are so special, why are they as interchangeable as light globes? Could anybody become a dictator, given the right image, fed the appropriate words and blessed with a little bit of luck? It’s a sobering thought, and it’s exactly what continues to happen across the world with terrifying frequency. 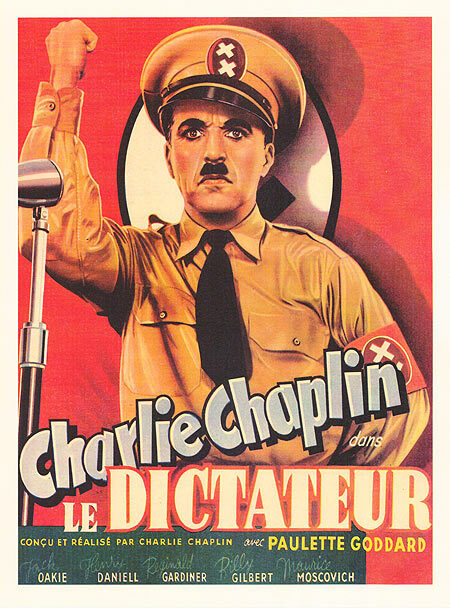 Thus instead of an old-fashioned romantic comedy as his follow-up to Modern Times, Chaplin gave us The Great Dictator, an audacious political satire that for all of its humour, is best remembered for The Speech, a profoundly poignant monologue where Chaplin breaks the fourth wall, and seemingly breaks into a third character, that of himself. It is one of the greatest spiels committed to film; but how strange, how wonderful, that such a serious speech was written and delivered (magnificently) by an actor known mostly for silent comedy. 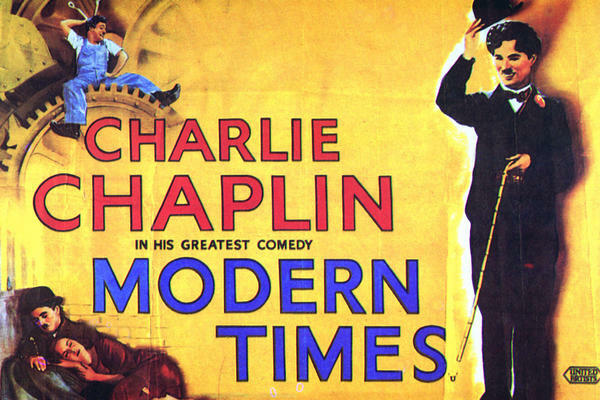 Modern Times and The Great Dictator are films rich in humour, pathos and humanity, from one of the guiding lights of early motion pictures, Charles Chaplin. For those of you who are enjoying the Jacques Tati retrospective, it should go without saying that Charlie Chaplin’s Modern Times and The Great Dictator are staples of the era, recommended most highly, as two veritable landmark achievements in the history of cinema. Modern Times and The Great Dictator screen as a double bill on Sunday June 22nd, 7pm.